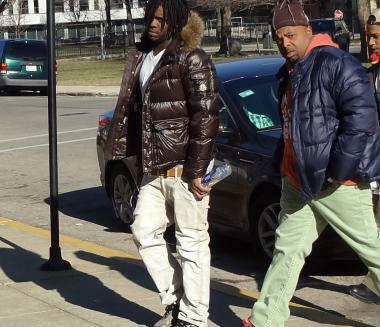 Keith Cozart, aka "Chief Keef" was called into court Jan. 2 for failing to keep in touch with his probation officer. CHICAGO — Before Chief Keef got a shot at hitting it big in the rap game, the Englewood teen star was the target of shots — bullets fired at him by police — that missed, DNAinfo.com Chicago has learned. While much has been written about the 17-year-old gangster rapper’s chances of getting locked up for violating probation on charges he pointed a gun at a cop, all the details of Chief Keef’s run-in with police have not been made public — until now. And it happened in broad daylight. Just before noon on Dec. 2, 2011, police responded to a call of shots fired in the 6100 block of South Indiana. Officers spotted Chief Keef, whose real name is Keith Cozart, walking out the front door of his grandmother’s apartment building in the 6100 block of South Michigan, holding a coat over his hands that were in front of his waistband, according to police reports obtained by DNAinfo.com. When a police officer tried to stop and question Chief Keef, the rapper dropped the coat, flashed a blue-steel handgun and sprinted through the vacant lot next door, according to police reports. When officers gave chase, Chief Keef — who was 16 at the time — twice turned and pointed the pistol at the officers, according to the police report. The officers “discharged their weapons” but missed, according to the police account. Chief Keef made it about a half-block before officers nabbed him in the alley of the 6100 block of South Indiana, according to the report. One officer suffered bruises in the struggle to detain the rapper. Police recovered the pistol, which was loaded, according to reports. Chief Keef was charged with four felonies — three counts of aggravated assault with a firearm on a police officer and aggravated unlawful use of a weapon. He also was hit with a misdemeanor charge of resisting arrest. When he was collared, police noted that 16-year old had two tattoos — "Fast" on his right hand and "Life" on his left hand. Chief Keef was held in the Cook County Juvenile Detention Center until a judge sentenced him to home confinement at his grandmother’s house. During that time on house arrest, Chief Keef made the now-famous video "I Don't Like," which got more than 20 million views on YouTube and helped him land a deal with Interscope Records, the label of rappers Dr. Dre, Eminem and 50 Cent. It wasn’t Chief Keef’s first felony charge. The high school dropout was arrested on Jan. 27, 2011, and charged with manufacture and delivery of heroin near a school, public housing building or park, a Class X felony, according to police records. Juvenile offenders are determined to be "delinquent" rather than guilty of charges. Chief Keef served time on home confinement on the drug charge, according to reports. Chief Keef’s lawyer Dennis Berkson declined to comment on the rapper’s arrest record. “I done got indicted selling all white,” Chief Keef raps on the song featured on his debut album “Finally Rich,” which sold 50,000 copies in the first week it was released. “White” is street slang for heroin. Chief Keef is slated to return to court later this month, when Cook County Judge Carl Anthony Walker is expected to hear testimony from an employee of a New York City gun range where the rapper allegedly fired weapons — which would be a a violation of his probation — during an interview with Pitchfork.com. If Walker decides Chief Keef violated his probation, the rapper could be placed into custody. In that scenario, it's unclear where he would serve time. In some cases, 17-year old juveniles are detained with adults at Cook County jail, authorities said.